The UPS PIco HV3.0A HAT Stack with Battery 450 is an advanced Uninterruptible Power Supply for the Raspberry Pi® A+/B+/2/3 and ZERO/W, that adds a wealth of innovative power powering/back-up functionality and development features to the innovative microcomputer! The UPS PIco HV3.0A HAT Stack with Battery 450 will automatically shut-down your Raspberry Pi® if there is a power failure, and can be set to automatically monitor and reboot your Raspberry Pi® once power has been restored! The UPS PIco HV3.0A HAT Stack with Battery 450 features a 5V 3A total current output on battery, designed for use on the latest Raspberry Pi 3! UPS PIco HV3.0A HAT Stack with Battery 450 offers now 3 User Programmable Keys, 3 User programable LEDs, support for multiple different chemistry of high capacity batteries, 2 x 3 pins bi-stable relay (Zero Power) configured as DPDT or SPDT, as also 3 x A/D 12-bit converters with pre-adjustable readings to 5V, 10V, 20V and 30V conversion (when used with Terminal Blocks PCB or separate external resistor). Now, with number embedded sensors (inbound current, outbound current, temperature, voltages), true 3.3V 1-wire interface, optional RS232 interface and many, many additional functionalities!! The UPS PIco HV3.0A HAT Stack is equipped with a 450mAh 15C LiPO battery (able to supply 6.5A) specially designed to enable safe shutdown during a power cut. Additionally, this can be easily upgraded to the extended 4000mAh or 8000mAh versions, which enables prolonged use of a Raspberry Pi for up to 16 hours without a power supply connected! Now, with new add-on board (PIco LP/LF Li-Ion 18650 Battery Holder) you can use all types of the Li-Ion 18650 batteries from electronic cigarettes approaching total capacity of 7200 mAh, as also 18650 LiPO and LiPo4Fe (called 123). The new PCB is 2 oz copper 4 layers, especially designed for powering systems offering Multilayer Copper Thermal Pipes for increased System Thermal Response and better passive cooling!! 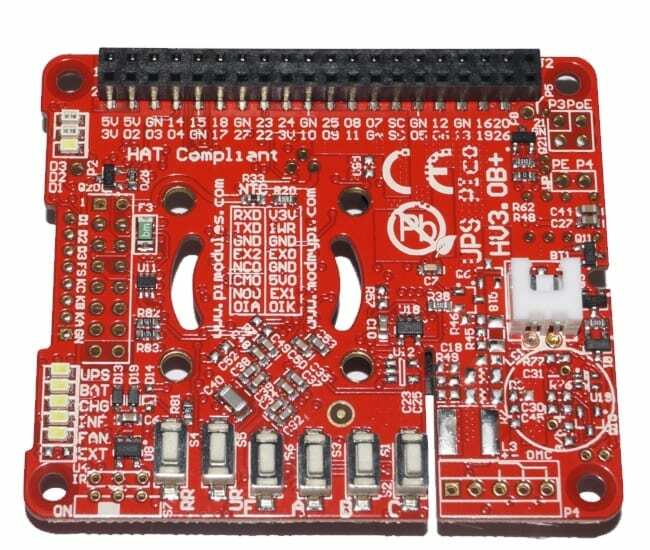 The UPS PIco HV3.0B HAT Stack with Battery 450 features a 5V 3A total current output on battery, designed for use on the latest Raspberry Pi 3! UPS PIco HV3.0B HAT Stack with Battery 450 offers now 3 User Programmable Keys, 3 User programable LEDs, support for multiple different chemistry of high capacity batteries, 2 x 3 pins bi-stable relay (Zero Power) configured as DPDT or SPDT, as also 3 x A/D 12-bit converters with pre-adjustable readings to 5V, 10V, 20V and 30V conversion (when used with Terminal Blocks PCB or separate external resistor). Now, with number embedded sensors (inbound current, outbound current, temperature, voltages), true 5V 1-wire interface, optional RS232 interface and many, many additional functionalities!! The UPS PIco HV3.0B HAT Stack is equipped with a 450mAh 15C LiPO battery (able to supply 6.5A) specially designed to enable safe shutdown during a power cut. Additionally, this can be easily upgraded to the extended 4000mAh or 8000mAh versions, which enables prolonged use of a Raspberry Pi for up to 16 hours without a power supply connected! The UPS PIco HV3.0B+ HAT Stack 450 is an advanced Intelligent Mobile Power Bank and Uninterruptible Power Supply especially designed for the Raspberry Pi® 3 Model B+, that adds a wealth of innovative powering/backup functionality and development features to the innovative microcomputer! The UPS PIco HV3.0B+ HAT Stack 450 will automatically shut-down your Raspberry Pi® if there is a power failure, supply mobile applications from battery source, and can be set to automatically monitor and reboot your Raspberry Pi® once power has been restored! It is equipped also with an Intelligent Externally Accessed (with Files Safe Shutdown) Slide Power Switch that allows to safety System Switch ON/OFF whenever you like, without worrying about files corruption as it is always properly shutdown the system before cable power will be disconnected. This new and very advanced feature, switches OFF also the Raspberry Pi® 3 Model B+ even if it is powered via their micro USB powering cable. This allows also to charge (optionally) the battery when Raspberry Pi® 3 Model B+ is OFF however still connected to the micro USB cable powering source. The UPS PIco HV3.0B+ HAT Stack 450 features a 5V 3A total current output on battery powering, especially designed for use on the latest Raspberry Pi® 3 Model B+! UPS PIco HV3.0B+ HAT Stack with Battery 450 offers now 3 User Programmable Keys, 3 User programable LEDs, support for multiple different chemistry of high capacity batteries, 2 x 3 pins optional bi-stable relay (latching – Zero Power) configured as DPDT 2Amp, as also 3 x A/D 12-bit converters with pre-adjustable readings to 5V, 10V, 20V and 30V conversion (when used with Terminal Blocks PCB or separate external resistor). Now, with number embedded sensors (inbound current, outbound current, temperature, voltages), true 5V 1-wire interface, optional RS232 interface and many, many additional functionalities!! The UPS PIco HV3.0B+ HAT Stack is equipped with a 450mAh 15C LiPO battery (able to supply 6.5A) specially designed to enable safe shutdown during a power cut. Additionally, this can be easily upgraded to the extended 4000mAh or 8000mAh versions, which enables prolonged use of a Raspberry Pi for up to 16 hours without a power supply connected! 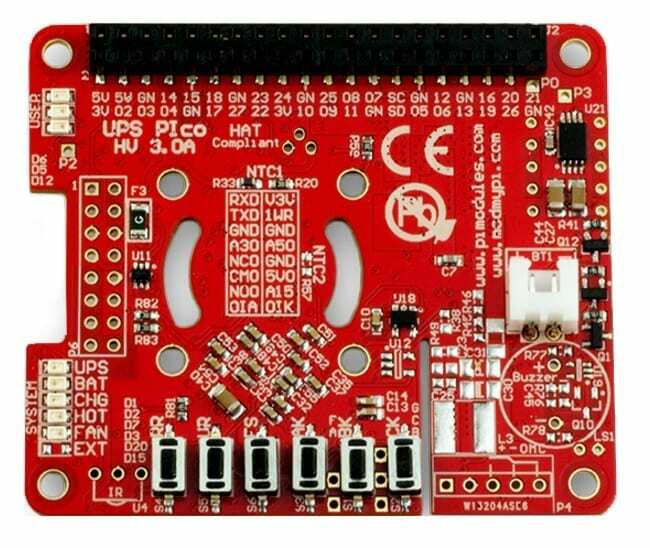 The UPS PIco HV3.0B+ HAT Stack 450 is Compatible with all models of Raspberry Pi®! !